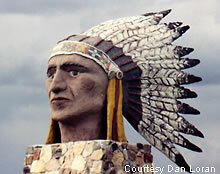 The Indian Head Sculpture is located on the Southwest corner of the town on the north side of Highway 1. Indian Head Sk. is approximately 100 miles north of the Montana and North Dakota borders. It is about 42 miles east of the Capital city of the Province Regina on Highway 1. 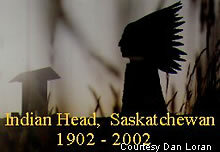 The Indian Head Statue has appeared on numerous television commercials, one for the Phone company Sasktel that is running at the present time. Coloration was applied by incorporating cement pigments into the final cement coat. 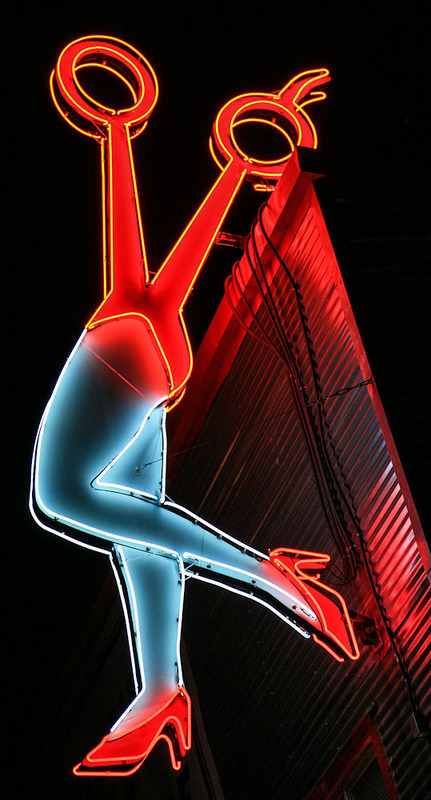 The sculpture was constructed in Saskatoon Sk. and transported to Indian Head at a cost of $12,750. This is also the 100th Anniversary of the town of Indian Head which be came a town in 1902. 1902-2002. 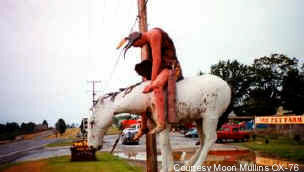 A certain eye-catching roadside attraction in Virginia is the "Indian on Horse" just off the road. Located on Route 340, south of Winchester, Virginia, the Indian appears to be slumped over, perhaps sleepy from all the carbon monoxide fumes from the passing automobiles. According to the photographer, recent work on this roadside treasure dated 1988 on the base. "A stunning roadside find." 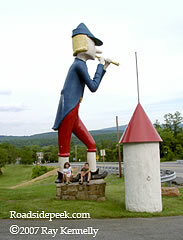 Trumpet Man is approximately 15 feet in height. Body has a very slight profile, with length of legs, torso, and size of head out of proportion. Trumpet guy was found at a former (possibly 50's or 60's) mystery play theme castle park. Figure is make of plaster-like material over chicken-wire Location is west of Bedford, Pennsylvania on Route 30 or Lincoln Highway. 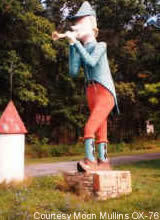 UPDATED 10/02 : The Trumpet Man looks like the Pied Piper from Dutch Wonderland,which still exists,on Route 30, outside Lancaster.